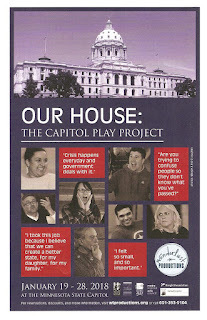 I've never experienced anything quite like Wonderlust Productions' Our House: The Capitol Play Project. I've been to site-specific productions before, but none that have been written specifically about that site, telling the true stories of the people who daily inhabit that site, with a cast largely made up of those people. The site in this case is our house, the people's house, the Capitol of the great state of Minnesota, and the people whose stories are told are not the famous and/or infamous politicians one usually associates with the government, but everyone who works there, performing the unglamorous day-to-day hard work of keeping the state running. After following the actors (and "real people!") around our house for two and a half hours (a building I have not stepped foot in since a barely remembered school field trip over 30 years ago), I felt both better and worse about the system that governs our lives. Our House is unabashedly sincere and optimistic about the people who work in government, but it's also harshly realistic about the inefficiencies and corruption within the system. It's a shame this is such a short run (just six sold-out* performances), and I really hope they bring it back. More impactful than any high school civics class could be, it should be required viewing for every citizen. "What you are about to hear is all true yet entirely made up." 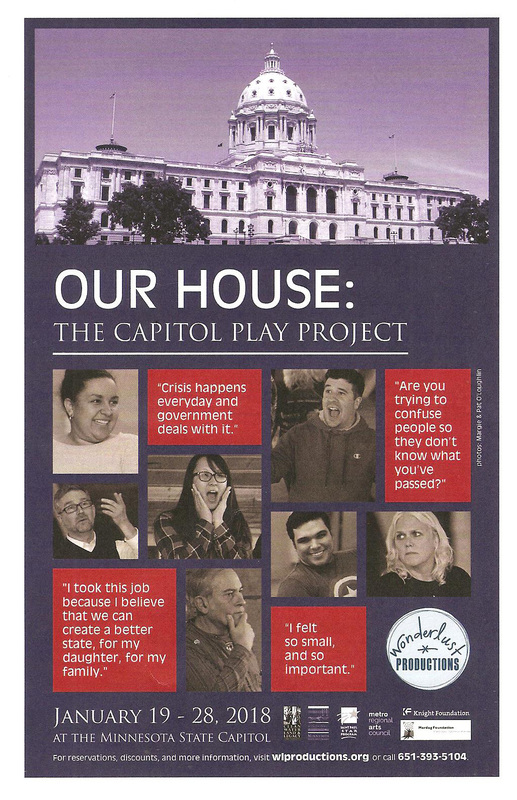 Co-writers/co-directors/co-Artistic Directors of Wonderlust, Alan Berks and Leah Cooper, spent three years researching this project by listening to the stories of over 100 people who work at the Capitol. They have combined all of these stories and characters into a fictional story that is as fun and playful as it is real and serious. The heroes of this story are a black woman named Sheila (Ginger Commodore) who arrives at the Capitol for her first day of work, only to find her young daughter Angela (Gabrielle Dominique) there protesting. A couple of staffers (Rachel English and Frank Kohlasch) assume that Sheila must be the controversial new governor's chief of staff, and soon the whole building believes it. Sheila can't believe that everyone is listening so intently to her opinions on justice and equality, even to the point of calling a joint session of the House and Senate! Eventually she's found out and goes back to being just a nobody who works at the info desk, but Angela becomes inspired after seeing how the system works and that there are ways, however difficult, to get people to listen. The mistaken identity story is a light-hearted and humorous way to guide us through the workings of the Capitol, and through the building itself. The audience is split into three groups, each with a different tour guide (Ann Daly, Ariel Leaf, and Mark Shepard). We're together for most of the first act in the basement hub of the building. In the second act, we move upstairs to witness three scenes in different parts of the building that all relate to our main story. Finally, we come back together again for the culmination of the story in the joint session, before one final singalong in the gorgeous rotunda, underneath the second largest unsupported dome in the world. Oh, did I mention there's singing?! I was not expecting that, and it came as a delightful surprise. The original songs (composed by Becky Dale, with lyrics by the composer and playwrights) are peppy and fun (one started off sounding exactly like "Be Our Guest") and provide another way into the story and the lives of these people. The cast earnestly sings and dances (choreography by Leah Nelson and Frank Kohlasch) in the most charming way, with cast-member Adam Whisner leading most of the songs on guitar (with Margie O'Loughlin on concertina and Greg Byers on cello). The 19-person cast is made up of about a third actors and two-thirds "real people," by which I mean people who are part of the Capitol community in some way. You can almost tell which are which, but in a good way. The enthusiasm and openness of the non-actors more than makes up for any training they might be lacking. They all do great service to these true stories, some inspiring and some infuriating, as they lead us through this beautiful building. We also get a bit of history of the Capitol (it opened in 1905 and was designed by Cass Gilbert, who went on to design the US Supreme Court), and have time to look around and take pictures (just don't linger too long or you might get yelled at by a stage manager for missing the next scene). As someone who sees a ton of theater, it's such a delight to see something so unique and so connected to our world. I believe in the power of theater to educate, enlighten, connect, and effect change, and Our House is a wonderful example of that. If you can't see the show*, remember that the Capitol belongs to all of us, and is open to the public every day, with guided tours available (more info here). *The three remaining performances this weekend are sold out, but you can take your chances on the waitlist 30 minutes prior to showtime (click here for details).